﻿ One year Wing chun kung fu Review. The only way to understand, even just a little, Martial Arts, is to go back to its roots, to immerse ourselves in their birthplace, culture, and language. I came to China because I couldn’t find in the occidental what I was looking for. In my hometown the teaching doesn’t cover the philosophical, mental, and cultural aspects which are integral parts of martial arts. I only saw the possibility of going to China to witness the life philosophy and try to learn from it and from those who live by it as much as I could. 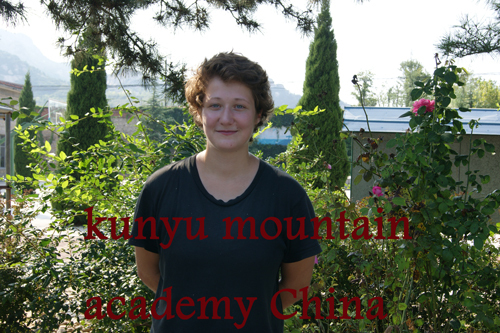 Then,I am in China kunyu mountain academy. Not to mention the outstanding skills of the masters, the spirit of the practitioners was nothing like what I was used to. It’s impressive to see that a world that seems out of reach, and at times light years away, is only a few kilometers away, doors open, and ready to welcome us. Being a few meters away from great masters, talking to them, training under their teaching, there is at the same time a spiritual rift and just a hand, their hands, outstretched to show us the way.I found here what I needed, and even if I could only share a tiny little part of what are their lives, it was one of the most overwhelming and reassuring experiences of my life. My personal experience led me to be interested in sticky hands Forms of Wing chun, that’s why I chose to train Wing Chun here at Kunyu Mountain, even though I never practiced it before. Both in these martial arts and the others I practiced simultaneously, I learned a lot. Also, I had the opportunity to practice martial arts that I only knew the names, and the practical and theoretical knowledge I had access to really enriched me. However, the greatest treasure I’ll bring back with me, in my opinion, is the discovery of Qigong, which has revolutionized the way I think of martial arts and pretty much everything actually. The benefits seem to be endless and I will certainly keep it as a lifelong practice. My encounter with my master, Master Guo, has been and will stay one of the most important and memorable factors of my life. Not to mention his extraordinary skills, he is an inexhaustible source of knowledge for all possible things. He is attentive, knows how to read his students, and adapt to them depending on their needs and way of working. He knows how to motivate us and bring us to give our all and surpass ourselves, simply because in exchange he gives us more and more of himself. Keen to teach and help, he knows how to be patient and is always ready to share his knowledge and guide us so we can benefit the most from out training. His humbleness, kindness, and open mindedness make an excellent teacher out of him and a model for every martial artist. As he says himself, being a martial artist is also being a gentleman, he entirely is. Actually, masters or members of the staff are always ready to make it easier for you. Translators are doing an amazing work and are scrambling for you when you need help or information. Their support makes everything administrative good. The place itself is more than appreciable. At the foot of the mountains, near lakes, perfect to retreat and still close enough to a big city for those who need it during the weekend, or just want to go to enjoy the sea. In the end, the past year taught me a lot about myself and allowed me to progress as much in my martial search as in the other parts of my life. And even though I’m sad not to spend more time near Master mu. I’m leaving with amazing memories and acquired knowledge heat in my heart, and the certainty that I will come back. Anais Spent one year in our kunyu academy.